The Metric and SAE sets reviewed here contain enough sizes to cover nearly all of the average users needs. From here I would buy individual wrenches if more sizes are ever needed. 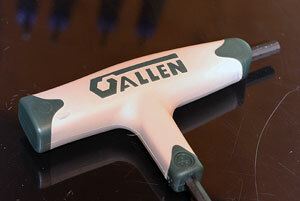 Yes, there really is an Allen® brand! Like most of you I have been using “Allen wrench” when talking about any hex wrench without realizing that there actually is an Allen® Wrench brand. Now I know and by the end of this review so will you and the world will be slightly more in balance again. 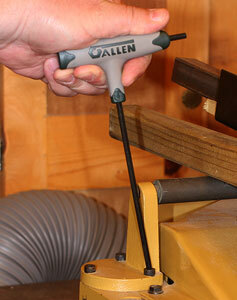 The Allen® Wrenches shown here are cleanly made from what appears to be quality steel that has been heat-treated. This heat conditioning is necessary to maintain some spring to stave off snapping the wrench on a tight fastener while remaining hard enough to resist rounding off of the corners. Throughout the evaluation I have not noticed any rounded corners nor did I ever get the sensation of the Allen® Wrench slipping. All of the Allen® Wrenches shown here have a ball end on the long side and a traditional straight-sided hex shape on the short leg that is built into the handle. If you haven’t had ball-end hex wrenches you are going to love them. While the ball end portion does not look extensive it gives the tool a substantial working arc that lets you work close to an obstruction without automatically beating a knuckle or two open. The T-handle of these Allen® Wrenches have a rubber-like handle molded onto the wrench at the T-shape junction to form an ergonomic grip. In addition to providing a smooth comfortable area to grip the Allen® Wrenches the surface enhances your grip so you can apply more pressure without having the wrench pop out of your hand when it slips. Wrenches comfortable even when applying a bunch of force. 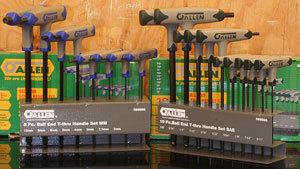 In this review we look at SAE and metric sets of Allen® Wrenches. The SAE set comes with 3/32”, 7/64”, 1/8”, 9/64”, 5/32”, 3/16”, 7/32”, ¼”, 5/16”, and 3/8” wrenches. The metric set comes with 2mm, 2.5mm, 3mm, 4mm, 5mm, 6mm, 8mm and 10mm wrenches. Both sets also include a metal stand with labeled positions for each wrench. Between these two sets the vast majority of hex head work is covered for most of us. I think it makes sense to have these sets in the shop and then buy any special sizes separately as needed. I like the T-handle style of hex wrench because they make it easier for me to work with tight fasteners. I have done mechanical work for 50-some years and the hands aren’t what they used to be. The more substantial, softer grip like those on these Allen® Wrenches makes a big difference in being able to apply force comfortably. Another aspect is the control they give all users. The non-slip surface and a better overall grip means less slipping and the potential damage to us and whatever we are working on. I used the Allen® Wrenches on several of my machines and in particular, hex head fasteners that I could not recall having ever loosened. It’s hard to expect anything sensational out of a hex wrench but the Allen® Wrenches do perform just fine. You don’t get the sensation that the edges are about to round off when the fastener is tight. While there is noticeable “winding up” of the wrench shaft when a lot of force is applied that is to be expected if we don’t want the wrench to snap off. 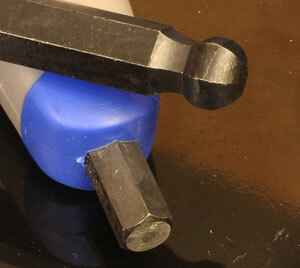 Using the straight hex ends built into the handles gives you lots of leverage when reachable fasteners are very tight. That said, I never had any trouble getting tight fasteners loose using the T-handle during the evaluation. The ball ends can let you work at an angle that keeps your knuckles farther from things that want to bash you open if you aren't paying attention or slip. Believe me, buying the ball ends is the better, less painful choice. The ball ends also work well at reasonable angles. I say reasonable because I know someone will pull the wrench as far over as possible and expect it to take full torque. For the more reasonable persons who realize that the ball end is meant to let you tilt the wrench away from an obstruction the ball ends appear to be more than strong enough for the job. Even when applying quite a bit of force at what seemed like a substantial angle the ball ends did not feel like they were about to slip or jump. The Allen® Wrench Sets reviewed here appear to be very good quality with a good design that allows them to function easily in all expected situations. I like T-handle wrenches like this because they make getting at more fasteners easier and reduce the chances of smacking my knuckles on anything when the fastener snaps free. Another point in favor of the Allen® Wrench sets shown here is their price. The #566566 SAE S10-Piece Set has a street price of $34.54. The #566566 Metric 8-Piece Set sells for- $26.46. (5-26-2012) Neither is too much money for a tool set that should last you a lifetime with reasonable care and use.